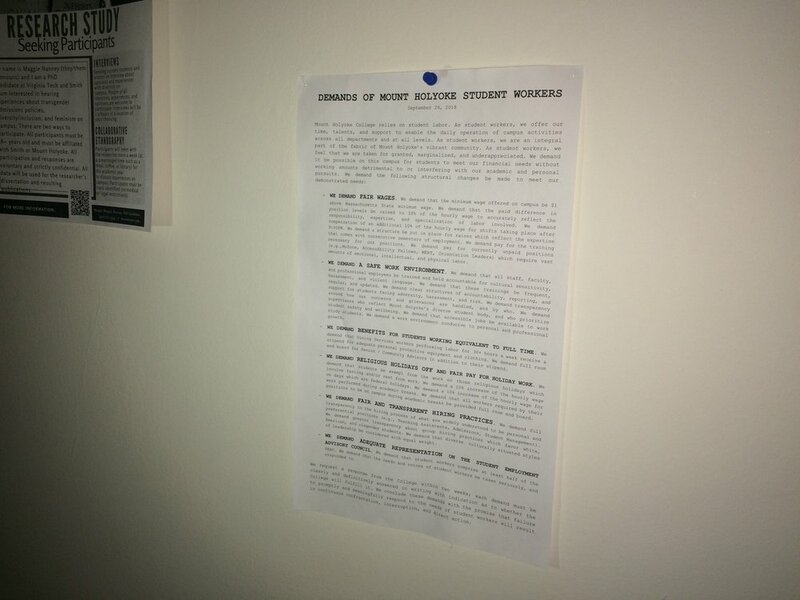 Student organizers posted the demands of student workers in residence and academic halls around campus. Last month, approximately 170 students worked together to write a list of demands to the administration in hopes of initiating better conditions for student workers on campus. The list of demands included an expectation that the College respond within two weeks and that each demand “be clearly and definitively answered in writing with indication as to whether the College will fulfill it.” After two weeks, if demands were not addressed, students threatened “continuous confrontation, interruption and direct action.” On Oct. 12, Mount Holyoke College responded to each of the demands. They will be addressing each demand in preliminary reports that will be released to student representatives throughout 2019. The response was issued on behalf of the College’s administration by Dean of Students and Vice President for Student Life Marcella Runell Hall, Executive Director of Human Resources Heidi Friedman, Director of Dining Services Rich Perna, Director of the Career Development Center Liz Lierman and Vice President of Communications and Marketing Charles L. Greene II. The response explains that the College is currently conducting investigations regarding the campus-wide budget process, financial aid and work-study, as well as other financial processes that directly impact student wages. After these investigations, the College will compile a series of reports that will be shared with student representatives for initial recommendations. “Myself and Chuck Greene, on behalf of the Officers of the College and the Office of the President, will take a lead on writing the reports along with The Student Employment Governance Committee (SEGC) and the Student Employee Advisory Committee (SEAC). The process will include ample student representation,” said Dean Hall. A primary concern among student workers is their wages. Their demand stated that the minimum wage offered for students should be $1 above Massachusetts state minimum wage, with a 10 percent increase in hourly wages for higher position levels and a 10 percent increase in hourly wages for shifts after 9 p.m. Student workers also demanded compensation for currently unpaid positions such as MoZone, MERT and Orientation Leaders. MERT, for example, requires 32 hours (or four shifts of eight hours) per semester of unpaid active duty. Student organizers also pushed for greater compensation for Community Advisors (CAs) and Senior Community Advisors (SCAs). “In the student demands there was a demand for CAs to get free room and board, something that is commonplace at most other colleges,” said student worker Cierson Zambo ’19. “There wasn’t even a mention of CAs in the [administration] response. At Smith [College], CAs and SCAs get paid more than 3 times the amount that CAs get paid here, which is equivalent to room and board for them, and they are doing the same job, with the same hours,” he said. Partially in response to student demands, the College has begun an initial investigation into wage structures for students. On Oct. 10, Perna, Lierman, Friedman, Hall and two student representatives, Theo Claire ’20 and Adelita Simon ’19, met to discuss the students’ demands. There are currently 210,000 student hours scheduled for the 2018-2019 academic year. A cursory calculation suggests that mandated increases in Massachusetts minimum wage would lead to a loss of more than 30,000 student work hours if the College’s budget is not increased, according to the College’s response to the demands. There will be a town hall meeting held in December 2018 that informs students how campus wages, jobs and budgets are decided. The second part of the administration’s investigation will look at how student jobs have changed over time. In particular, it will address how centralized dining may have created new positions for student workers. In line with that commitment, the College is developing a plan to train dining staff, with a focus on managers and supervisors. A key point of training will include guidelines on the observance of religious holidays. A final policy recommendation will be given in May 2019. The administration will develop a clear and consistent policy on compensation for early arrival, which applies to any student who is required to come back early to perform their duties for a student employee position, like Orientation Leaders. In regards to the grievance process, the College stated, “There may be a need to simplify the approach for students to report issues of harassment, safety concerns and other job grievances.” The current avenues for students to make claims or seek advice in such cases are grievance procedures (found on the College website), community insensitivity forms, the Honor Code Council or the Ombuds Office located in Safford Hall. In response to complaints of a lack of transparency in hiring processes, this past year, staff supervisors were informed that hiring must be timed in a way that allows students with financial need and workstudy awards to apply for positions. Rules requiring first-year students with workstudy to work in dining were eliminated. The administration is also conducting research to understand how and which students are hired for certain jobs across campus in order to increase transparency. Student workers demand that they should comprise at least half of SEAC, and their voice should be responded to and taken seriously. In response to these demands, there will be increased student representation on the SEAC. The administration will propose a structure that increases student representation while including representation from different groups (dining, administrative, student support, etc.). “Student workers are continuing to organize, share our stories and find common ground. Over 250 student workers are currently involved, and we welcome additional interest and involvement,” said Claire. Claire emphasized that the administration’s response does not mean an end to the student workers’ movement.